Matrimony is tied into The Eucharist. Violating the Bond of Matrimony through Divorce, does NOT mean that this Sacrament is dissolved. It cannot be dissolved. The Catholic Church, however, through Annulment, judges as to whether or not a Valid Marriage had occurred. One may not enter into a Civil “Second Marriage” as this would constitute Adultery & both parties under Church Law would be denied the Sacraments, particularly Holy Communion & Penance. This was called Excommunication when I was educated in the RC Diocese of Brooklyn. Divorce was unheard of when I was in Catholic School. I had a Speech Therapist. A nice woman, she resided in Forest Hills Gardens in Queens. She was divorced with two sons. She was not Catholic. I think she was Lutheran. I asked my Mom about Divorce. Her answer was “That’s what Protestants do.” Annulment is NOT in Protestant Vocabulary. Nor is it in the Vocabulary of the Eastern Orthodox Churches. Divorce, sadly, is in both Protestant & Eastern Orthodox Faiths. For Christ said that Marriage is Forever & Divorce is out of The Question, so Second Marriages were out of The Question. Like “What Game On FOX is Pope Francis I watching?” He, from Observation, either doesn’t understand Doctriine, or disregards Doctrine completely. As the Utterly Liberaltastic Jorge Mario Cardinal Bergoglio, a person who was Divorced & Civilly Remarried in the RC Archdiocese of Buenos Aires, Argentina, often received Holy Communion with Cardinal Bergoglio’s Permission. He often visited Los Barrios(Slum Areas), where many people were married a few times, and authorized the giving of Holy Communion to these Multi Marrieds, who divorced and Civilly Remarried. It is contrary to Church Law and The Magisterium to do this but Bergoglio was a Disobedient Archbishop. The Apple doesn’t fall far from the Tree. In his early goings as Pope Francis I, Bergoglio gave Telephone Permission to two women who were divorced/Civilly Remarried to receive Holy Communion. These are the only two women that anyone knows of. It may have occurred more times than what we know of the two women. It is as if Rome is the New Buenos Aires. As there were two Synods, called “Synods On The Family”(More like “Synods Of Doom” as Christopher Ferrara calls them) in October, 2014 & 2015, called by Pope Francis I. His Intent is to Change Doctrine via the “Pastoral Route”, whereby the Law stays on the books but a new interpretation is given to that Law. Actually The Neo Catholic Broadcast Journalist Who runs a Studio under subsidy of a Fat Cat Backer In Texas, is into Censorship of the variety which would make the CHINESE Envious. (The North Koreans would be even more envious). Papalotry runs deep here. Censoring a report that Raymond Leo Cardinal Burke called for Pope Francis I to be more clear at Synod Of Doom Part One, tells me that this Internet TV outlet, would be useful to the current Papacy, as a Mere Propaganda Tool. The Executive Producer is named in part for a Mouthwash. Of course, if Timothy Michael Cardinal Dolan comits an act of Flatulence aboard a Northbound IND 6th Avenue D Train headed to Yankee Stadium, this outlet will break in with Correspondents in New York & Detroit to announce the Flatulence, but when Pope Francis I is pronouncing Heresy in an Exhortation, it is WHITEWASHED. MR Mouthwash, your report is Drivel. It says NOTHING about the Evil being perpetrated. It is as if The Evildoer does NOT exist. And you don’t read the Vatican Documents. YOU ARE A MOUTHPIECE FOR A FAT CAT IN TEXAS, whose Nuns in Oyster Bay, North Shore of Long Island where that FAT CAT GREW UP, didn’t smack this guy around enough. Neither did his High School Brothers in Mineola, in the Town of North Hempstead, teach this guy a Lesson. Are you sure that you’re a Newsman, Mr Mouthwash? The Remnant Newspaper, Catholic Family News, akaCatholic.com, Rorate Caeli & Mundabor’s Sites, I fully recommend as Catholic Sites. The Internet TV outlet in Ferndale, MI, heavily hosted by Mr Mouthwash, is NOT on my recommended list. What Is It With Modernists That They HATE Faith & Beauty? Guess What-The Day of Candy & Cards, being so Secular today, is on the Tridentine Latin Mass Calendar, a Beautiful Saint’s Day, honouring a Man, both a Physician & Catholic Priest. The Date is February 14th & it honours a Martyr. Through him from God, a girl named Julia received her Sight for she had been blind since birth. The Saint’s Name is Valentinus(Valentine), an Ancient Saint of The Catholic Church. But, in anticipation of The Novus Ordo Mass, a New Calendar was drawn up, derived from the Presbyterian & Reformed Calendars, in the name of The “False Ecumenism”, which plagues the Post Vatican II Church of Today. The “Reason” given was that Valentinus was a legend. To The Modernists, it’s good for “Ecumenism.” To me, it’s a Crock of BS. Saint Valentine’s Day has been celebrated with Joy & Reverence for many centuries. A Priest who officiated The Sacrament of Matrimony in hiding away from Roman Emperor Claudius The Brutal, risked Death. Was ordered in 1967, for the Novus Ordo Calendar, which began to occur on November 30th, 1969. And yet, though no longer on the current Church Calendar, St. Valentine’s Day is celebrated, albeit a Secular Humanist Celebration. And, knowing today’s Novus Ordo Catholic Church, probably no Catholic School Student would even have suspected that This Saint & Martyr, ever existed. Thanks Tim Cullen of The Remnant Newspaper for explaining this. The Roman Latin Church is in a Diocese called Brooklyn and the counties of Kings & Queens are covered by the RC Diocese Of Brooklyn. While The Metropolitan of The New York Province is Timothy Michael Cardinal Dolan, he is NOT The Ordinary of The RC Diocese Of Brooklyn. The Ordinary means the Bishop who has jurisdiction in his Diocese & as Ordinary, ordains Deacons & Priests under the Jurisdiction. He is the Primary Teacher of Faith in his Diocese, just as Cardinal Dolan has jurisdiction over the Boroughs of Manhattan, Bronx & Staten Island, as well as Counties North of NYC, such as Westchester, Putnam, Dutchess, Rockland, Orange, Ulster & Sullivan Counties. New York City, like London & Rome, have more than One Diocese in the City. New York City is NOT exclusively MANHATTAN ISLAND. My(Brooklyn) Diocesan Bishop is the Most Reverend Nicholas Di Marzio(Who originally comes from Newark, NJ, a part of The New York-New Jersey-Connecticut Metropolitan Area). Do NOT Blame Cardinal Dolan for everything which goes on in The 5 Boroughs. Only Three Boroughs are his Jurisdiction. 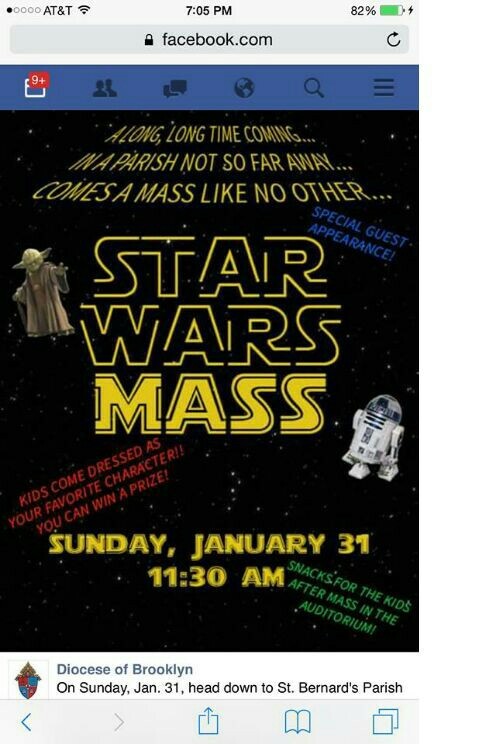 The Matter of “The Star Wars Mess” is in the RC Diocese Of Brooklyn. This Farce is between Msgr Jamie Gigantiello, the Vicar For Development for The RC Diocese Of Brooklyn, as well as Pastor of St Bernard’s in Mill Basin, Brooklyn & The Most Reverend Nicholas Di Marzio. For Tears began streaming at the start of Prayers at the 11:00AM Tridentine Latin Mass at St Agnes on E43rd Street between Lexington Avenue and 3rd Avenue in Midtown Manhattan. And it doubles my resolve to see to it that The Novus Ordo Mass be consigned to The Dustbin of History. In the Parish where a Mr Jimmy Kimmel was Christened, namely St. Bernard Of Clarveux in the Mill Basin Section of Brooklyn, what I believe to be a Most Sacreligious Act is to occur on this Sunday, January 31st, 2016 @ 11:30AM EST. The “Star Wars Mess” has arrived in Mill Basin, Brooklyn, of all Places. I might have expected this in Park Slope, Brooklyn or Jackson Heights, in Queens, home of People who may be covered under the 2014 Synod Of Bishops(Synod of Doom as Mr Ferrara puts it). But Mill Basin, next to Marine Park? WHAT? 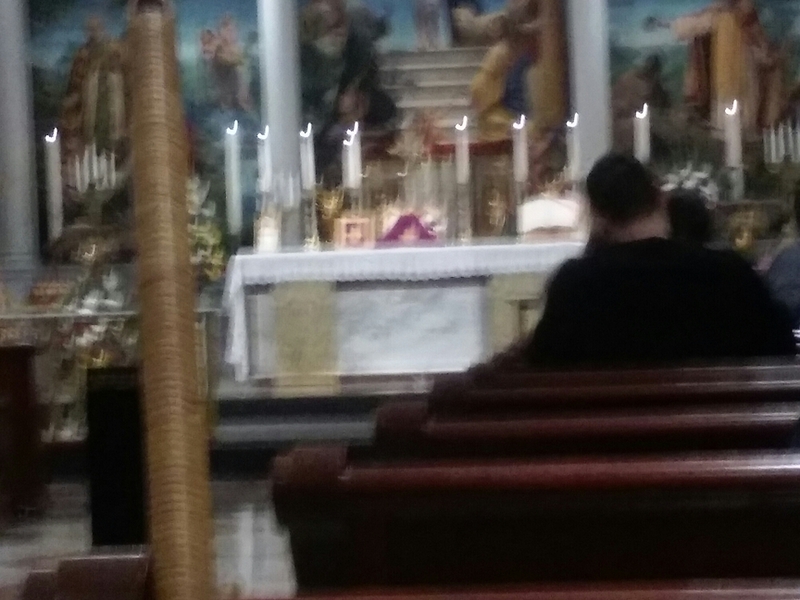 For I was at The Tridentine Latin Mass at St. Agnes on E43rd Street between Lexington Avenue and 3rd Avenue in Midtown Manhattan. As Mass on Sextagesima Sunday began, as a Preparation for Lent as the Easter Cycle began last Sunday with Septuagesima Sunday, Tears streamed out of my eyes while thinking about The Blasphemous Sacrilege Of The Novus Ordo Mess In Brooklyn. Above is the Beautiful Altar of St. Agnes on E43rd Street. Here we kneel for Holy Communion & receive The Body Of Christ on the Tongue. The Only Ministers Of Holy Communion are Priests and Deacons. While it may not be the High Altar of Holy Innocents on W37th Street between Broadway and 7th Avenue, this Parish was the Original Indult Tridentine Latin Mass Parish in the RC Archdiocese of New York. It is also known as the Parish where “Life Is Worth Living”, Hosted by Venerable Archbishop Fulton J Sheen, often originated from. Also, certain EWTN Programming with Fr George Rutler, originated from St. Agnes. Mum was baptised here in 1921. Noted History Professor & Remnant Writer, Dr. John Rao & The President of The Latin Mass Society Of New York, Mr David Lane, were at the Tridentine Latin Mass at St. Agnes. They were duly Notified of The Blaphemous Mess in Brooklyn. In fact, Msgr, you should try something RADICAL at the next Family Mass. Like try something TRADITIONAL. The crowds will come. Large Families will come to that Mass.